This kit is compatible with the D5, D4, D4S, D3X, D850, D810, D810A, D800, D800E, D500, and D300S cameras. Live View can be used with the following cameras: D5, D4S, D810, D800, D800E, D750, D610, D600, D500, D7200, D7100, D5500, D5300, and D5200. Currently, only the D5, D850, and D500 DSLRs can be used with the WR-10 system to wirelessly control radio-capable Speedlights. For full compatibility and support for the latest DSLRs and Speedlights, users may be required to send their WR-A10 Wireless Remote Adapter to Nikon for a free factory-installed firmware update. Create an advanced wireless camera system with your Nikon DSLRs and Speedlights by picking up the WR-A10 Wireless Remote Adapter. This unit connects to select DSLRs with a 10-pin connector and allows users to use the WR-R10 Wireless Remote Controller, which functions as a transceiver to wirelessly trigger the shutter release or to control radio-capable Speedlights such as the SB-5000. When paired with the WR-R10 on select DSLRs users can operate one camera as a master to trigger multiple connected cameras at once from up to 164' away. Box Dimensions (LxWxH) 4.5 x 3.9 x 2.8"
Box Dimensions (LxWxH) 4.4 x 3.9 x 2.7"
Box Dimensions (LxWxH) 4.5 x 3.9 x 2.7"
WR-R10/WR-T10/WR-A10 Wireless Remote Adapter Set is rated 4.6 out of 5 by 116. Rated 5 out of 5 by Go Buffs from Wireless is the way to go... After wrestling with the older, direct 10 pin attach model for many years, it was time to move up to wireless... if you have one of the older models like the D300, then you will definitely need the remote adaptor to attach to the 10 pin connector... performance so far has been flawless when shooting landscapes. The small size is both a blessing and a curse - it weighs nothing and takes up minimal space but the downside is it is very easy to misplace unless you are very systematic in its use... Pricey as all Nikon gear is but a decent nvestment for 'hands free' shutter release. Rated 2 out of 5 by tevans9129 from Good while it lasted Hobby photography use and worked great for 14 months. Used less than a dozen times. Now it operates auto focus and displays all data but will not actuate the shutter. Nikon will not give an estimate for repair and considering the price, I would not expect it to be inexpensive. Therefore, I am going to replace it with a third party unit. I should never have spent $$for a remote shutter release. I would not purchase this again. Rated 3 out of 5 by Delmar_Photog from Sufficient DS850 Solution I just received delivery of my Nikon D850 and needed a remote control solution. I read and read descriptions of this package. After conferring with Nikon Support I went ahead and got it. On a Nikon D850 the nine-pin adapter screws into the camera. The rectangular bit plugs into the top. Turn on the camera and the remote works to control the shutter. All that is well and good. Why the 3 star rating: 1) why on a $3300 pro level camera does it take 2 adapters to establish wireless control, 2) the two adapter setup seems very, very likely to break off or get damaged by even a moderate impact, 3) on my Nikon D750 I could do the same thing with just an IR remote (no adapters) as the IR receivers are built into the camera. IMHO Nikon should have built this into the camera body (so it is protected and always available) and/or included the IR sensors. Rated 5 out of 5 by Gregory B. from Awesome Remote I use this remote for star shots and rear curtain with slow shutter release situations. I can also see this being useful for bird or wildlife pics. The release is very consistent. Works great with my D810. I know there are other third party options that are probably cheaper. The price would be the only thing I could say that I don't like about it. Rated 4 out of 5 by AndreB from Should have been integrated into camera body Very useful system and a must if you want to remotely control a flash like the Nikon SB-5000. ?However, Nikon should have integrated the radio inside the camera body (at least on their newer models like the D500, and D850). The way the adapter is secured onto the 10-pin connector is OK, but it looks fragile. I can see a risk of having the camera strap getting stuck around the adapter and damaging it. The remote control becomes very handy for focusing and triggering the shutter from a distance. Rated 5 out of 5 by Lee from Works so much better than PocketWizard I purchased 2 SB5000 units to use with wirelessly with Nikon D850 and the required Nikon WR-R10 and WR-A10. The flashes synched immediately and are easily controlled using the on-camera controls. Much better than my old system of remote control via PocketWizard equipment. But I spent 2 days trying to troubleshoot why Auto ISO would not operate when I used the WR-R10 and WR-A10 attached. I know that Auto ISO will not operate when the flash is used remotely,? however, what I discovered after several hours is that Auto ISO does not operate if the WR-R10 and WR-A10 are attached to the camera unless the Photo Shooting Menu | Flash control | Wireless flash options setting is "Off". If that setting is "Radio AWL", Auto ISO will not function. Hope this saves some time for others who may have tried the same equipment/settings configuration. Rated 2 out of 5 by Dariusz from Poor radio system If you want to use this radio as a trigger then it works great but there are other cheaper options but I purchased this to control 4 of my sb-5000 flashes and I'm sorry to report that this is not reliable system I keep having problems with triggering the flashes it works in one location then on responds in another so I have to spend 5 minutes to pair all 4 flashes again I'm at the point that I looking for different solution, plus controlling sb-5000 form the camera or other sb-5000 flash is a nightmare do to nikon over engineer interface it just going from menu to menu to change anything I say just stay awy from this system. Rated 5 out of 5 by George from Reliable Release Although you're specifically told not to leave it attached to the camera, (because it could get caught on the camera strap and damage the 10-pin cable release connector), I leave mine permanently attached anyway. I have always hated the 10-pin cable release, because it's impossible to attach a release cable while wearing gloves in cold weather. This remote release is reliable, and has proven more useful than I anticipated. Basically I no longer use the camera's shutter button when actually taking the picture. No camera shake, and it frees you up to place the camera and take the shot while holding a light modifier in an optimum position, since you no longer have to be directly behind the camera. What firmware is this item shipping with? Manufacturers do not indicate to B&amp;H which firmware version is in their product and we unfortunately do not have the ability to ascertain the answer with any item in our warehouse. Since our stock moves rather quickly, it is more than likely it has the latest firmware already in it. Since there is also the possibility of new firmware being introduced at anytime, it might change even during the time it takes to ship from us to you. We recommend that once you have received your product, check with the manufacturers website to see if you are running the latest version. If not, you can at that time do an update. I have a Nikon D300 and a Nikon D600. I want to control my cameras wirelessly using Nikon camera control pro 2 with an iMac computer attached.Does this meet my needs? This remote would be used as a general wireless shutter release for the Nikon D300 or D600 as well as other Nikon models. To have wireless control with the D300 and Camera Control Pro 2, you would need the Nikon WT-4A, B&amp;H# NIWT4A. However, with the D600, you would could only connect the camera via USB to your computer while running Camera Control Pro 2. Please see the image below for reference. Yes this will work on the D750. You just don't need the 10 pin adapter. I have the D750 and have been using it for some time now and it works great. I also have a D300 and use the 10 pin on it. What type of batteries and how many are needed? The WR-T10 takes a CR2032 3 V lithium battery: http://bhpho.to/1lAi377. The rest of the set is powered through the camera. Configuration: D850, WR-R10/WR-T10/WR-A10, sb5000 off shoe commander mode, sb700 and sb800 off shoe remote mode. Nothing configured to d850 shoe. Will the sb700 and sb800 be configurable (compensations) from camera? This remote kit would essentially be the commander for the D850 in this case if the SB-5000 is off camera. The kit can only control the SB5000 from the D850 with radio triggering. The SB5000 would need to be placed on the camera in optical commander mode in order to control both the SB700 and SB800 off camera. Also, you can have the Nikon SU-800 Wireless Speedlight Commander Unit B&amp;H # NISU800 on the camera while all of your flashes are off camera in line of sight. Will it work on both the D200 and the D7100? Yes, the Nikon WR-R10/WR-T10/WR-A10 Wireless Remote Adapter Set will work with both the D200 and the D7100 camera bodies. The WR-R10 transceiver can be plugged directly into the D7100s accessory port, and to use this set with the D200, puse the WR-A10 adapter to plug the WR-R10 transciever into the 10-pin port. I am looking at buying a d4 as a backup camera. I have a d500. Will this work woth an SB5000 on both cameras? Yes, the Sb50000 will work on the Nikon D4. is this remote compatible with Nikon F-90X ? This remote is not compatible with the Nikon F-90X. 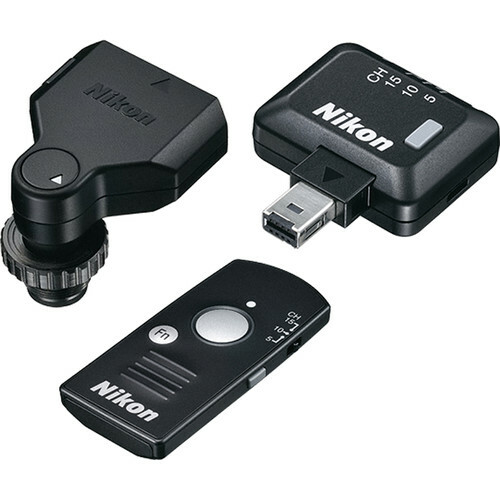 This remote adapter set is designed for use with Nikon's digital SLRs and will not be compatible with 35mm film cameras.